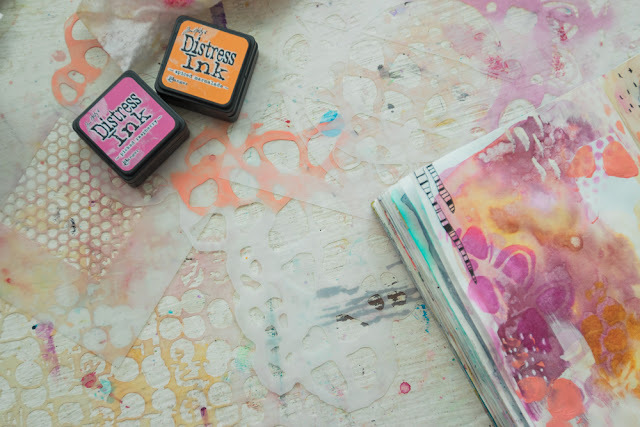 StencilGirl Talk: Guest Designer Ali Brown: Watercolors & Distress Inks with StencilGirl Stencils! Guest Designer Ali Brown: Watercolors & Distress Inks with StencilGirl Stencils! My name is Ali, and I am a scribe... Documenting and journaling using a Traveler’s Notebook has brought me much joy for over two years. I have a little channel over on YouTube sharing my journey, and I love to curate pretty pictures on Instagram as well. 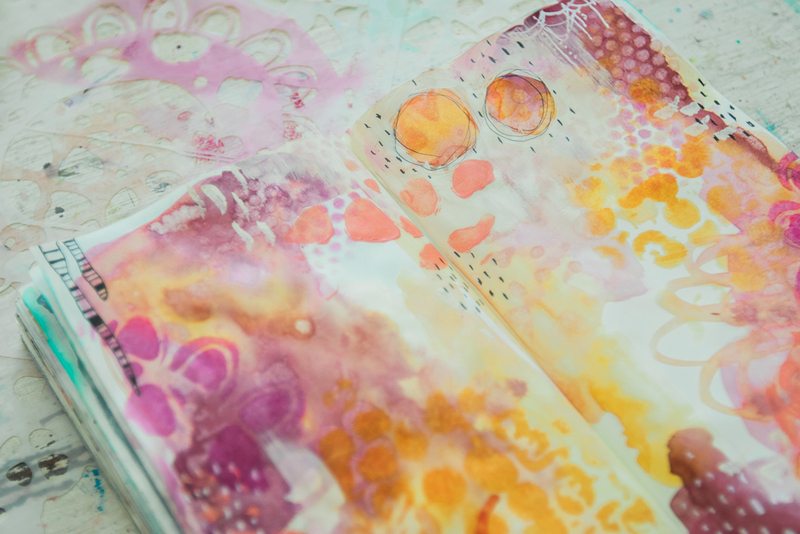 The way I journal has been a sustainable means of memory keeping and keeps me from feeling ‘behind’ like I felt when I used to scrapbook. I can tape in bits of ephemera from my life and pictures using this amazing little thing called washi tape... Think, scrapbook meets Smashbook. It’s amazing! I have experienced healing from the freedom within the pages of a traveler’s notebook insert. 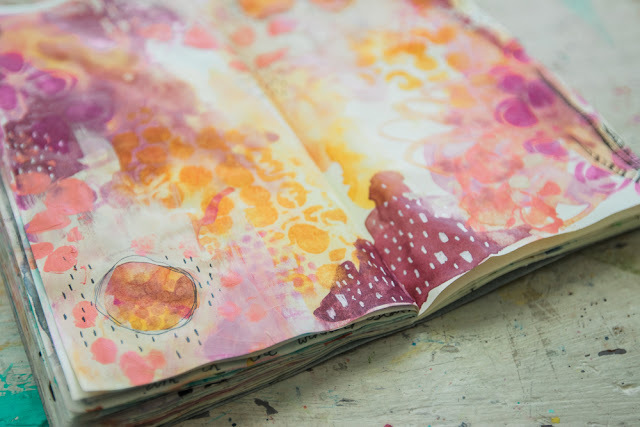 There’s the freedom to plop some color on a page and explore with art, or to simply process thoughts on blank pages with only words when needed. One of my favorite ways to relax before journaling is to decorate my pages using watercolors. I have recently discovered a way to add further dimension to my pages using stencils and ink. Thankfully, I discovered StencilGirl and was blown away with the variety of stencils they had! What amazing tools stencils are to quickly give interest to a page. I’m so thankful for this company. I wanted to share with you a process video of how I play on a page before adding words. I hope you enjoy this video and consider becoming the scribe of your life. Because your story, is worth telling. 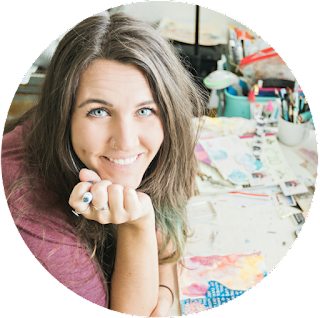 Ali Brown is a southern gal who finds joy in vibrant colors, inky fingers, washi tape and memory keeping in traveler’s notebooks. Journaling and arting is her happy place. Loved watching this come together! Loved it....love those colors together!!! Very inspiring. Thank you!!!! This is great! I am so new to water colors, it's always fun to see what they do. I had no idea you could lift them with a baby wipe. Love your colors and your composition. Thanks for sharing!